For a while now, I have been wanting to create DIY interactive art that incorporates design and data. A large part of this came from following design/architecture blogs, learning about public policy work being done in parks/recreation/public spaces, and getting to know the works of TED speakers such as Nathalie Miebach and Candy Chang. The original idea for the jacket came from a small Norwegian design studio called Drap og Design ("Murder and Design") which created the jacket about 2 years ago. The challenge for me was to figure out how to reverse engineer the jacket myself based on the pictures and a lot of Googling. More than anything, I wanted to use this project as an opportunity to learn new skills/topics and take myself out of my comfort zones of Adobe Illustrator, Lightroom, and R Studio. I came in with zero knowledge of circuits, Arduino, soldering etc, and I now feel that have a very basic understanding of those. My goal for a while now has been to orient my side projects towards interactive/public art, so I figured this could be a nice push in that direction to get me going. 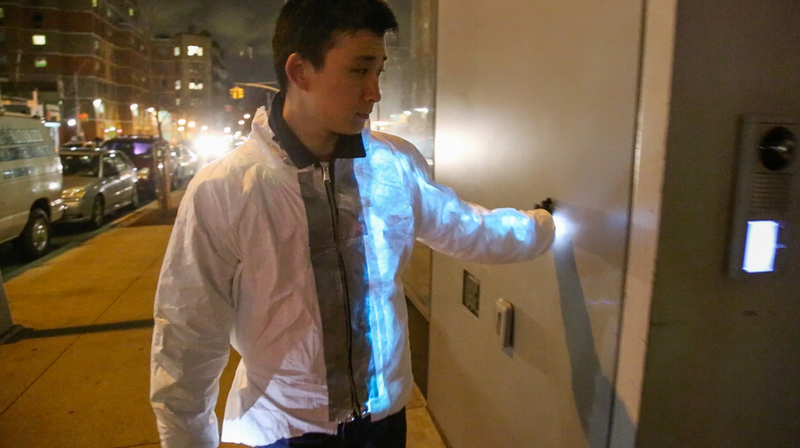 There were two main halves of this project: the electronics and the jacket itself. The electronics followed a circuit diagram similar to this example. Essentially, I connected the color sensor to the Arduino, which was then connected to the LED strip. 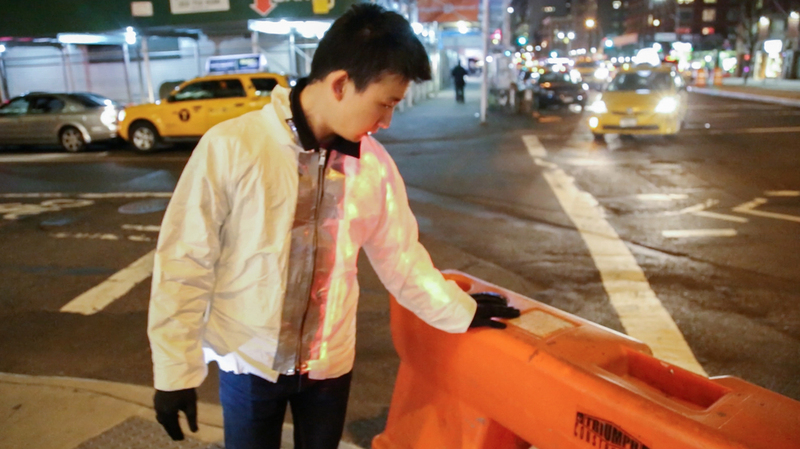 Color would be read into the color sensors (attached to gloves), which then change the color of the LED strip. Meanwhile, the jacket consisted of 4 layers from innermost to outermost: the basic jacket, mylar blanket, the electronics, and finally the painter's suit. 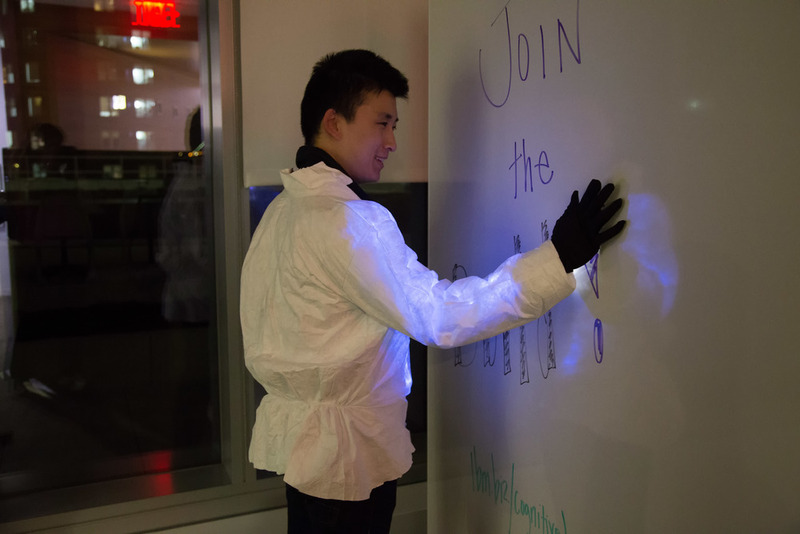 The mylar blanket and the painter's suit were mainly used to help disperse the LED's light.